The inspiration for the all-new 2015 Alfa Romeo 4C dates back to the 1967 33 Stradale, the homologated version of the racing Type 33, which is considered one of the most beautiful cars of all time. Like the 33 Stradale that combined extreme mechanical and functional requirements with undeniable Alfa Romeo style and performance – the 4C coupe shares its body forms and follows this performance tradition with an undoubtedly Italian-styled composite body “clothing,” a state-of-the-art carbon fiber and aluminum structure, and a high-performance turbocharged engine. The Alfa Romeo 4C is inspired by the century-old tradition of Alfa Romeo and projects the brand’s authentic values into the future: Italian style, performance and engineering excellence, offering maximum driving satisfaction in total safety. The “4C” name recalls Alfa Romeo’s great sporting tradition: the acronyms 8C and 6C in the 1930s and 1940s distinguished racing and road cars fitted with powerful eight and six cylinder engines. The 2015 Alfa Romeo 4C model’s designation continues this tradition with the latest all-aluminum 1750 cc turbocharged direct injection four-cylinder engine. Alfa Romeo engineers continued the use of state-of-the-art materials by creating the bodywork entirely of SMC (Sheet Molding Compound), a low-density, high-strength composite material that is 20 percent lighter and dimensionally more rigid than steel. Providing the ability to create complex shapes while saving weight by 20 percent compared to steel are PUR-RIM (injected polyurethane) fascias and rear spoiler. Engineers even optimized the Alfa Romeo 4C’s windshield and side windows by using 10 percent thinner glass to reduce weight by up to 15 percent. 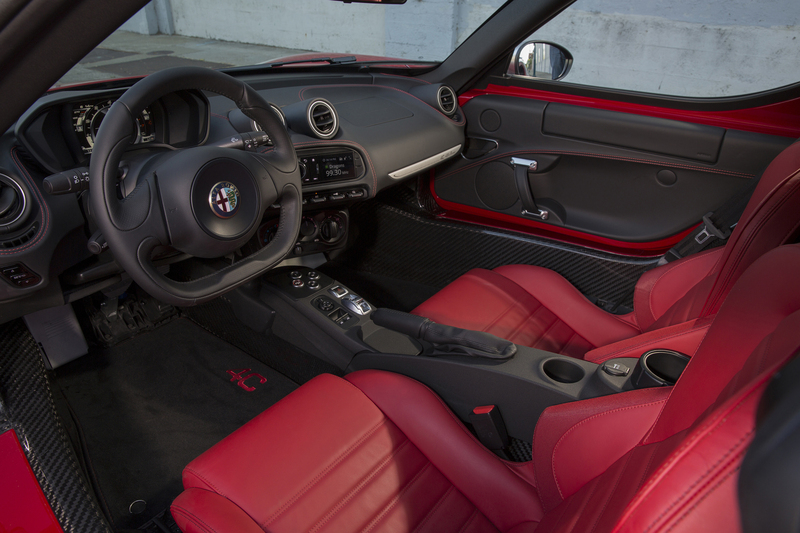 The driver-built cockpit inspired by the legendary 1967 33 Stradale, features flat-bottom performance steering wheel with paddle-shift controls and aluminum pedals speak to the brand’s racing spirit. Emphasizing the Alfa Romeo 4C’s advanced technology and focus on lightweight technical solutions is a 7-inch full-color thin-film transistor (TFT) instrument cluster that displays simple, high-impact graphics to keep the driver focused on the road, or track ahead. Finally, two sport seats feature a carbon fiber and fiberglass reinforced-composite structure to deliver the strength and seating position needed for performance driving. 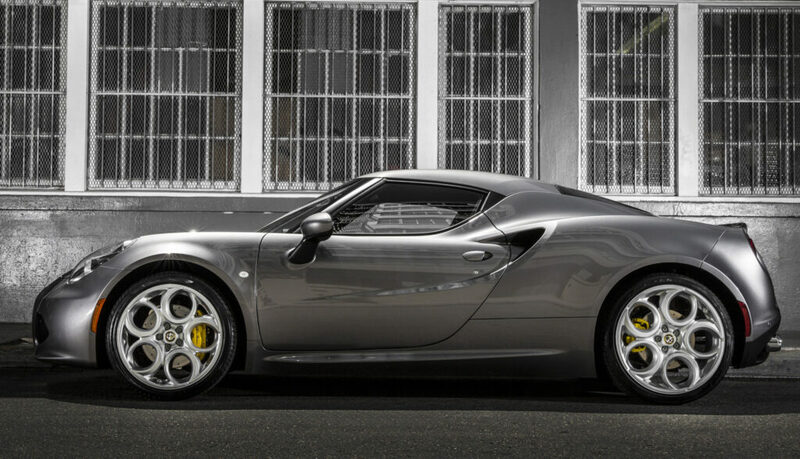 The engine is the beating heart of any Alfa Romeo, and for the 4C, it beats to an all-new 1750 cc direct-injection 237 horsepower all aluminum engine. To ensure exceptional performance and drivability on the racetrack or city streets, this new engine features cutting-edge technical solutions, including direct-injection, intercooler, dual (intake and exhaust) continuous variable-valve timing (VVT), a camshaft with eight counterweights, and intake and exhaust systems optimized for Alfa Romeo 4C’s mid-engine layout. A new generation turbocharger features a pulse-converter exhaust manifold to exploit pressure waves and boost torque at low-engine speeds. A waste gate valve adjusts turbo pressure and improves the engine’s efficiency. Advanced scavenging technology enables the Alfa Romeo 4C to maximize torque at low engine speeds and deliver more response to driver input by increasing combustion efficiency and turbine speed, all while eliminating turbo lag. As a result, torque delivery is instantaneous, with a peak of 258 ft.-lb. (350 Nm); 80 percent of which is available at only 1,700 rpm. 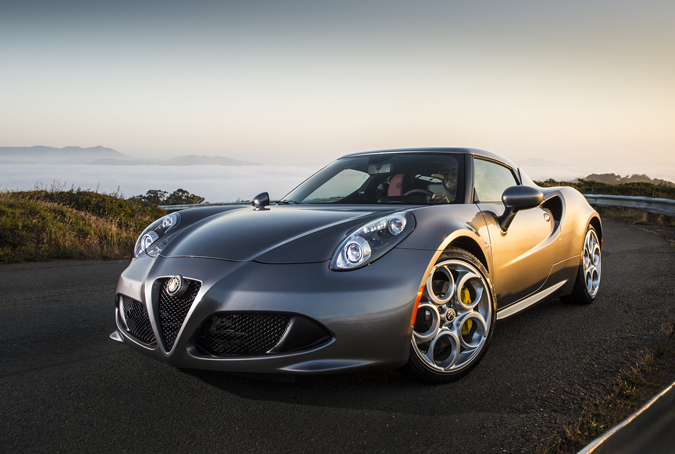 Teamed to the all-aluminum engine is a paddle-shifting Alfa TCT twin-clutch transmission, which has been specifically tuned for the all-new Alfa Romeo 4C. With its uniquely calibrated software that adjusts with the Alfa DNA selector system, the Alfa TCT’s gearshifts are designed to become most aggressive in the Dynamic and Race modes. The Alfa TCT system also integrates a “launch control” mode – delivering the utmost acceleration possible as soon as the driver releases the brake. Only 500 serialized 2015 4C Launch Edition coupes will be available through 86 Alfa Romeo dealerships with a MSRP of $68,400; followed by the a standard 4C coupe with a MSRP of $53,900.